Ralph Lauren has designed a desktop mixology kit perfect for cocktail-loving Valentine’s partners – if you have $4995 to spare. 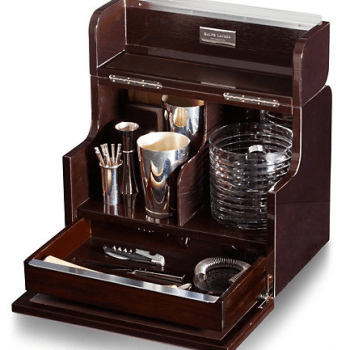 The Vanderbilt Mixologist Box comes complete with “refined bar accessories” including a lead crystal ice bucket and a crocodile-skin mixology book. The portable kit, named after the shipping and railroad family prominent in late 19th century America, is finished in an Italian rosewood veneer and even has an individually numbered metal plaque. “The Vanderbilt box is the ultimate luxury for entertaining whether you’re in a penthouse suite or at a country estate,” Ralph Lauren says. Only 100 have been made, adding a layer of exclusivity to the already opulent Valentine’s option, so time is running out if you want to make a $5,000 investment in your beau’s cocktail-making skills.